Racepak has an excellent selection of A/F controllers and sensors created specifically for tuning race engines. Each of these 2 and 4 channel controllers are designed to be connected to the V-Net cable of Racepak V-series recorders. All sensors have a 13” pigtail cable, and the controller has a 37” cable for attachment to the sensor. These lengths cannot be altered. Controllers are ordered by cylinder bank layout. Racepak A/F sensors are compatible with either gasoline or methanol fueled engines. Gasoline application will display A/F ratios between 9.55:1 and 20:1, while methanol is shown from 4.22:1 to 8.7:1. Please specify the type of fuel you will be using when ordering. Each sensor includes one weldment and plug. 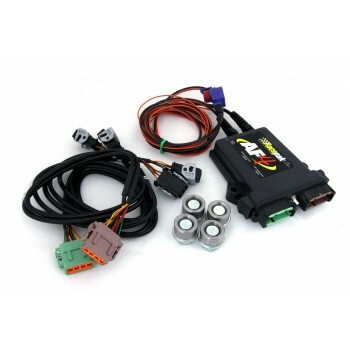 Air/Fuel sensors can be used with all V-Net products and can run on 12-18 volt battery systems.